The picture represents our progress through life, particularly our Christian walk through life, as we draw closer to God. In my picture the presence of God is represented by the summit of the mountain… the shiny, pointy bit at the top! The idea of discarding distracting things from life has been on my mind recently; this cartoon is a product of that thought. The picture shows a person climbing a mountain towards the summit, which represents the goal the mountaineer is reaching for. As he is climbing he realises that he needs to get rid of things that “weigh him down” & hold him back. 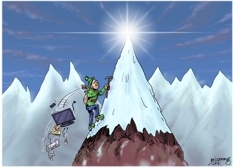 You can see that he is throwing things away; those as the items or trappings of modern life which he feels are slowing him down in his efforts to reach the summit. The closer the climber gets to the top, the less equipment he needs, but also, the less space there is at the top of the mountain for all his equipment in any case! In terms of our Christianity the picture is drawing our attention to the all-sufficiency of God, & how little we need (physically) to enjoy His presence. Some people have found that as they get closer to God, the less earthly, material possessions they need. This idea is represented in my picture by the mountaineer throwing objects away the closer he gets to the summit & he looks pretty happy to do so too! Many people have found that as they draw closer to God they experience the desire to get rid of earthly things, especially items that are a distraction to that goal – whatever they may be. It is strange (but wonderful) to realise that we don’t need all the paraphernalia of modern life (TV, technology & what not) in order to encounter God. Indeed, as the mountaineer in my picture has discovered, the less weight we carry (in terms of distracting & unnecessary stuff) the faster & easier we climb towards our goal! 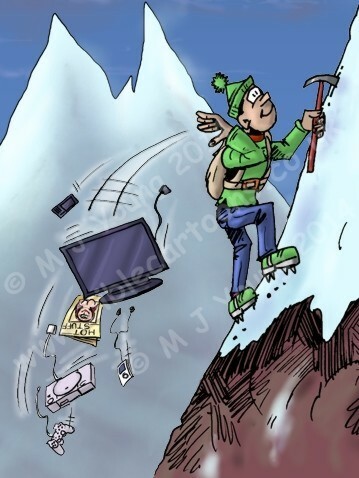 Mountain Climber – close-up of the climber & what he is throwing away! The items that the mountaineer is discarding are a mobile ‘phone, a TV, an mp3 player, a gaming console & a questionable magazine! The objects I have drawn are only representative of common, everyday objects that might compete for our attention today. The items are not “wrong” as such (except the magazine!) but they represent whatever we might find is distracting our attention, & sapping our strength & perseverance from attaining the goal of our endeavours. We realise, sooner or later, that any item which is distracting us has simply become more trouble than its worth! These items would be unique to any given person climbing the mountain. For a modern-day mother I might have included a TV, a phone, an ironing board, etc. Her goal (mountain summit) might be to be the best mother to her children that she can be. The items she would be discarding would be those things she personally found distracted her from achieving that goal. For an ancient Egyptian in the court of Pharaoh, the goal or summit might have been Pharaoh himself! Many men have claimed to be god after all! I might have included a sack of grain, an Egyptian idol, grains of sand, etc. Anything which distracted that ancient Egyptian person from performing their job in court would need to be discarded: anything which prevented them from serving Pharaoh wholehearted & faithfully. For a modern scientist the summit glow might be the end of some research they are conducting, or a theory they are developing. I might have included a computer, magazines on modern philosophy, a ticket to an amusement park, etc. Anything which distracts him or her from their study, & which threatens to take their attention away from their research might be considered “baggage” that needs to be discarded. For the Christian, the goal is Jesus the Christ. We strive to become more like Him as each day passes. He gives us the Holy Spirit, who enables us to move forward toward that goal, although we never reach it (ie perfection) on this side of life! So for the Christian, the blazing glow at the summit is Jesus. And the items we personally find distracting or holding us back from being more like Jesus need to be identified & thrown away. Sermon/teaching theme suggestions: This picture could be used to talk about the necessity of discarding things as we make the spiritual ascent towards God. Distracting objects, technology, habits, etc which cause us to stumble or make little headway towards the Lord may well have to be discarded, enabling us to make for the “better land” i.e. closer to God, without the distracting items in our lives. The picture might also be used to illustrate patience, persistence, trust (in God’s goodness), hope, dedication & determination. The mountaineer in the picture has to have these qualities in order to attempt to climb a mountain – in the same way we do when we “climb” towards our spiritual goals.